"The pseudoscience of chiromancy or palmistry (palm reading) attributes special meanings or divinations to markings on the hand. 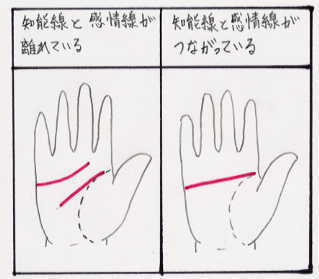 In chiromancy people with a single transverse palmar crease are very intense in their characteristics. They are said to have unusual psychic powers and are friendly with animals (most likely because of that). They have a hard time fitting in with others who have the normal pattern of palmar creases (called the "mahakah" in an Indian language). But since they share the same energies amongst each other, they get along very well together. It's just not so easy to find others with the condition (called the "perakee" in the same Indian language), so the single has to look closely to find another perakee. Often individuals are unaware they have this feature. Some may have erroneous beliefs that the crease has grown because they moved their hands in a different way to other people, and they may be ashamed of it and try to hide it while others may think that the rest of the world has similar hand lines. " that wraps it up quite nicely.